This is the first of the Cala/Leopold Stokowski Society historical reissues that I have listened to so I was interested to hear it as both a performance and an historical document. Richard Gates’ liner-notes focus more on the relationship between Stokowski and this repertoire rather than any analytical investigation of the works themselves. This seems quite fair to me given that this disc will be bought because it is Stokowski’s Schubert and Dvořák, not the music itself. To further underline the fact that Stokowski is central to the music-making here disc the orchestra is “his Symphony Orchestra” and the Dvořák - the earliest recording here dating from December 1947 - was the first major piece recorded by this ensemble. So to the performances themselves. The disc opens with three excerpts from the Rosamunde Incidental Music Op.26, recorded in 1952. Stokowski as interventionist is least apparent in the Overture; from following the score there don’t appear to be many of the re-touching of dynamics or instrumentation of which he was so fond and is to be found elsewhere on this disc. In fact all of the Schubert here shows Stokowski in sensitive form with his characteristic use of rubato falling within the bounds of allowing the music to breathe naturally. There are a couple of places in the slow introduction of the Overture where I wish the end of a four bar phrase didn’t signal yet another rallentando. The Allegro Vivace which accounts for the bulk of the Overture is remarkably free from mannerisms and to my modern ears all the better for that. As engineered, the effect is a considerable improvement over that to come in the Dvořák with the sound spectrum far more even and the balance allowing the strings to produce a true pianissimo. However, this really is no more than an opener for what, for me is the – unexpected - highlight of the disc. The Entr’acte No.3 in B-flat major as presented here is in effect a Stokowski transcription. He interpolates Schubert’s Piano Impromptu No.3 in B flat into the piece giving it an ABA structure. But more than that there is the kind of affectionate phrasing immaculately realised by the players that is Stokowski at his best. It might not be authentic, it might not really be Schubert but it is fantastic music-making; full of the kind of personality-led conducting that is heard all too rarely today. Likewise the remaining two Schubert excerpts with the Tyrolean Dances - another Stokowski reworking - in particular being played with musicality to spare. These later dances were recorded nearly three years before the other Schubert here and eighteen months after the Symphony. In sonic terms they lie between them as well – not as warm or detailed as the remaining Schubert but a whole lot better than the Dvořák. I see that the Schubert is transferred from original master tapes whereas the Dvořák comes from a private collection – presumably a set of discs. The four Schubert pieces are worth the entry price of this disc on their own. 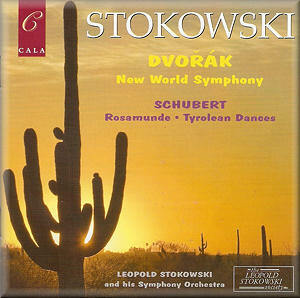 Which brings me to the performance of the Symphony No.9 in E minor “From the New World” by Dvořák. It was this that started me thinking about the composer/performer relationship. The key to this surely lies in whether the performer sees themselves as messenger - accurately passing on exactly the notes and their attendant instructions - or as interpreter, giving voice to something implicit but not necessarily explicit in the notes alone. In reality all performers lie somewhere on a line drawn between those two extremes as indeed does the taste of the music-loving public. Recent years has seen a shift largely towards the explicit with the rise of critical editions and authentic performance practice. Ultimately it is for each listener to decide whether the interpretive additions to a performance illuminate or distract. The first two times I listened to this performance I had starkly different reactions to it mainly because the second time I followed a copy of the critical edition of the score and it bore in on me how much Stokowski ignores not adds - as one might have expected. The first time I listened purely as an overall vision of the work and as such it works – just about. To sum it up in one word I would say volatile; barely a phrase goes by without Stokowski imposing an ebb or flow to it. Not surprisingly he ignores the exposition repeat in the first movement and while he observes most of the then traditional rallentandi into the lyrical second subjects most of this movement presses on with none of the grace or elegance that so defined the Schubert. The famous Largo is weighty and slow. The liner-notes point out that amongst the many stellar players in the orchestra the cor anglais is played by Mitch Miller who went on to fame as a producer and presenter of light and pop music. He plays this solo very beautifully but with a more pronounced vibrato than many modern players and a tonal quality that sounds closer at times to a single reed instrument – unusual but not unattractive. The Scherzo is the least “altered” of the movements with both the second subject and the trio allowed to lilt appealingly. The Finale is more interventionist again. Although marked allegro con fuoco - effectively fast and fiery - Stokowski imposes one of his biggest unmarked slowing-ups at only the ninth bar to prepare for the first subject proper; momentum is lost almost before it is established.. I hear little of the affection that so marked out the Schubert here. As a high-octane drive through a movement it has a certain roller-coaster excitement but surely it does not serve the music well. The Symphony as a whole is spared Stokowski’s penchant for textual amendments; a woodwind chord at the end of the first movement introduction is sustained for no particular reason. More crassly he adds two cymbal crashes on the fff climaxes in the finale - in a Bruckner Seventh kind of moment. Even worse there’s a totally spurious tam-tam stroke at bar 323 of the same movement – this time in a Tchaikovsky Pathétique manner. I love Stokowski’s arrangements but I cannot respect that as a musical choice. The liner-notes mention that at the time of its original release Decca’s “Full-Frequency-Range-Recordings” were causing a massive stir with the quality of the sound they provided. My guess is that this recording and performance with its steroidal approach both musically and sonically is a knee-jerk response. I haven’t yet mentioned in detail the quality of the recording or transfer of the symphony. It is significantly worse than the Schubert. Even allowing for its historical status I found it crude and unappealing. As mentioned above it comes from a private collection. The main problem - pardon the pun - is what sounds like a mains hum throughout: loud and at a not very low frequency. The original engineering is close and in the main ungrateful. Given the stellar nature of the line-up the strings in particular sound scrawny particularly above the stave. Also, the microphone placement is microscopically close-up. At one point in the slow movement you can hear the lead second violinist’s pizzicato coming through against the rest of the orchestra. All of the lower instruments seem to have been directed to ignore any dynamic less than mf – you can hear this in the string playing. The attack of the bow to string is essentially loud; this is not quiet playing amplified in the mix. So much of the simplicity - in the very best sense - of Dvořák’s writing and scoring is simply steam-rollered. This became so apparent when I followed the performance with a score. As I hope is clear I really do love and appreciate interpretations where performers take full responsibility for their choices and don’t hide behind a slavish adherence to the letter of the score alone. To my mind this is the musical equivalent of saying you were just following orders. But with taking responsibility comes respect for the composer too. To put it very simply, as presented here I would have to say Stokowski respected Schubert but not Dvořák. Trying not to obsess over the demerits of the latter I compared this with several other versions I had to hand. Three famous, yet very different approaches drew me in instantly. George Szell with his terrifyingly drilled Cleveland Orchestra make the finale truly fiery and virtuosic. Whilst he too cannot resist the occasional unmarked rallentando - although to a fraction of the degree Stokowski imposes - this is a dramatic if somewhat unsmiling reading. Then comes the equally renowned Istvan Kertesz and the LSO – sonically in a different league without the devilish drive of Szell and for me lacking the last drop of emotional intensity that makes this such a great piece. But best of all has to be Karel Ancerl and his Czech Philharmonic Orchestra. In some ways plainer - his is the fastest Largo by about a minute – but the only one to play it in a crochet/¼ note feel as marked in the score - but the sheer variety of moods across the Symphony’s entire span comes through most clearly. I adore the incomparably idiomatic sound of the Czech players which reaches true catharsis with the various themes hurled against each other in the very final pages of the piece. This touch makes the lapse into exhaustion of the final dying-away chord both logical and profoundly moving – life and death stuff. I simply don’t hear that from Stokowski and I wished I had. So certainly a mixed blessing of a disc. When it’s good it is very very good indeed. When it’s bad it embodies the worst of a superstar conductor placing himself above and before the music. But I would not want to be without these performances if only to ignite the performer/composer debate all over again. Stokowski was never one for middle ground mediocrity and whether a listener finds it insightful or insulting is why we collect recorded music.